In the beginning, interacting with the Bible was a read-only proposition. But interactions with the Good Book are a little different these days. Just ask some of Grand Canyon University’s computer science students. They are boosting how readers interface with the Bible — by going high-tech and using virtual reality to immerse users into those stories. A team of computer science students demonstrated their work at the Undergraduate Learning Community & Research Symposium on Wednesday in the Technology Building. Ethan Nichols (right) from the 3D Printing Biotechnology Team talks about the team’s research during the Undergraduate Learning Community & Research Symposium on Wednesday in the Technology Building. “Virtual Reality for Biblical Re-enactment” was just one of five presentations at the event, hosted by Student Engagement and Academic Affairs. Attendees also explored poster presentations and visited with students at more than a dozen tables who were eager to share what they’ve been doing in learning communities such as DECA, TEDx, Honors STEMist and the Biblical Theology Club, to name a few. His team, which also included Edward Lon, Trevor Gladwin and Spencer Thai, showed an in-progress, birth-of-Jesus manger scene. Rosenlof donned a pair of futuristic glasses that are actually a holographic computer called the MicroSoft Hololens. It allowed him to interact with what was on the screen. With an air click, he was able to virtually touch different objects in the screen and even interact with Mary and Joseph. He could click on menu items that read “Tell Me About Yourself” and “Who’s the Father” – an option that got a laugh from the audience. Tommy Fowler, Thomas Gleason and Joshua Lee tell the audience about Survey Stack, a program they created to help nonprofits digitize their paper surveys. In “Survey Stack Hackathon,” computer science and information technology student presenters Tommy Fowler, Joshua Lee and Thomas Gleason told the audience about the project they’re working on to help nonprofit groups digitize their paper surveys and better handle the data they collect from those surveys. Oftentimes, nonprofits don’t have the ability to go all-digital, and places they visit or work don’t always have internet access. Converting paper surveys to digital form is often time-consuming, requiring hours of manual data entry. “We wanted it (the group’s solution) to be really easy for any nonprofit to use,” said Gleason, and so the team used a program called Docker. They also wanted it to be cost-efficient and secure. The team started the project while competing at PayPal’s Opportunity Hack 2018. They won second place and a $5,000 prize — $1,000 of which they received after the event and $4,000 they will receive if they install their Survey Stack solution at the nonprofits’ place of business on or before Jan. 11, 2019. Student presenters from the College of Education spoke about their work at Garcia Elementary School in the struggling Murphy School District in 2017-18. “Many of the teachers and students didn’t utilize the library very often, and we wondered why,” said Julia Haug. It didn’t take them long to find out why – the books in the library were outdated, and there wasn’t a big selection of books. According to research, “students need a print-rich environment to become proficient readers,” added student presenter Lexi Bontrager. So GCU’s teacher candidates joined with a few community partners and, in the end, were able to donate more than 2,050 books to the school – that’s in addition to other work at the campus, such as student-teaching. This year, GCU’s COE students are at Westwood Elementary School doing similar work. They are in the midst of collecting teddy bears for Westwood students. “We’ve very proud of our work,” Haug said. Mallory Durnbaugh and Austin Paredes present their team’s research on finding a better way to analyze the overall cardiovascular health of individuals. 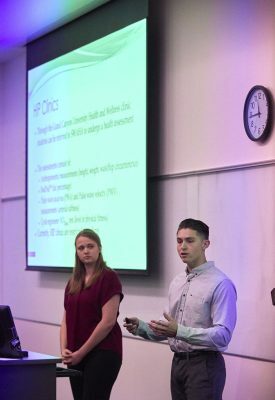 Student Wellness and Health Association student presenters Mallory Durnbaugh and Austin Paredes spoke about their work to find a way to better analyze a patient’s overall cardiovascular health. Instead of looking at results from singular blood pressure assessments – the kind we all get when we get check-ups at the doctor’s office, “What our research group did is we wanted to use ambulatory blood pressure monitoring instead,” Durnbaugh said. Their study involved using an ambulatory monitor to keep track of the blood pressure of 65 women who were divided into two groups – weight-cyclers and nonweight-cyclers. A weight-cycler is someone who repeatedly loses weight and gains it back again. They wore a blood pressure cuff for 24 hours that took their blood pressure every 15 or 30 minutes. “On average, our weight-cyclers had a higher blood pressure than the nonweight-cyclers,” she said, which was a result the group did not see in the resting, singular blood pressure assessments. “We personally believe that ambulatory blood pressure readings are truly a better representation of a person’s cardiovascular health than looking at that single blood pressure measurement,” Durnbaugh said. 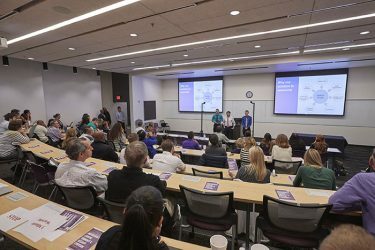 Paredes spoke about GCU being a gold-standard accredited Exercise is Medicine campus. Exercise is Medicine is a global health initiative managed by the American College of Sports Medicine. He also told the audience about the campus’ HIP Clinic, where the campus community can receive extensive health testing, including the VO2 max test, the gold standard in testing one’s cardiovascular fitness. “One of our goals is to extend the scope of the HIP Clinics. Being at the center of a lower-income community gives GCU an excellent opportunity for community outreach. 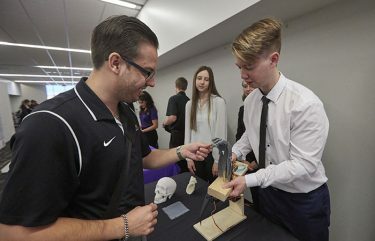 Just as GCU has a strong relationship with the K-12 schools … GCU can have a direct part in improving the health of the local community,” Paredes said. The final presenters, who have worked with Arizona-based raptor rescue organization Wild at Heart, spoke about the Desert Owl Population Improvement Project. The pygmy and Western burrowing owl populations are of particular concern, particularly in the Southwest. Their population numbers are diving, in part, because of encroachment by humans and the loss of their habitat. The problem exists not only in trying to hatch these owls in captivity, but researchers also are seeing a decline in the wild, too. A research team in the College of Science, Engineering and Technology wants to reverse that population trend. Madison Strong, Sarah Saffer and Destiny Woods speak about their work to create hatch boxes for desert owls, whose populations are in decline, particularly in the Southwest. Wild at Heart has created a synthetic hatching environment for conservation, but it hasn’t been as successful as they hoped, said the team. 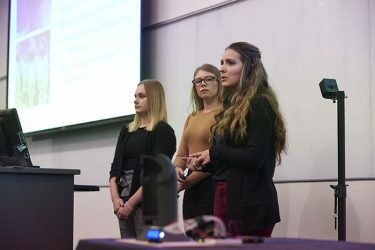 “We hope to construct a box that would possibly replicate these environments (the owls’ natural environment),” said student presenter Madison Strong, who addressed the audience with Sarah Saffer and Destiny Woods. Their box will regulate the internal environment with regard to temperature and humidity and will have a live feed. It will be modified for the wild, so the team is working on two versions. They hope to have a box ready in April for hatching season and by September 2021 for the wild. The team also is working on a lower leg prosthesis for an injured burrowing owl, who was found tied to his siblings. They’re hoping the prosthesis will not only help that owl but others. They are working to have the prosthetic completed by June. Several learning communities also manned tables. At the Speech and Debate table, Angel Cruz spoke about one of her persuasive speech topics – how insurance companies are using DNA tests such as 21 and Me and Ancestry DNA to decline coverage and how pharmaceutical companies are using those test results to raise their rates. “We’re doing as much as we can for our members. … What we’re building with our club is a community and a family,” she said, adding how the FHCA is out in the community, too, representing GCU. Provost Dr. Hank Radda said this is the fifth year the University has organized the Learning Community & Research Symposium. Student presenters must go through a vetting process to be included in the event, attended by campus leaders. Students not only have to be knowledgeable about content but have to be able to make a persuasive argument. What an amazing thought: “A lower leg prosthesis for an injured burrowing owl!”! Best of luck to the team!